Masters celebrate their being and their celebration casts an enchanting spell on the seekers around. One such spell is this exquisite poetry penned by Swami Ram Tirtha, narrated as well as explained by Anandmurti Gurumaa in this video. It talks about the voyage of a seeker who embarks on to the path of seeking Lord. Amazingly enough he doesn't just find That but is submerged in That. It further says that one is not just submerged but becomes That. However before becoming That one's present identity is ruined, for it is adulterated with impurities of anger, desires and what not. Infact only when this impure 'I' undergoes the ruin that the pure 'I' comes to manifestation which is That itself. 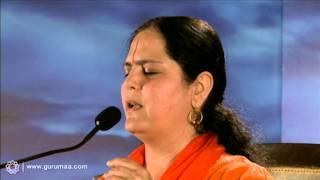 Get into the essence of this beautiful poem as Gurumaa explains it here in this video.